CronusMAX stopped working? No power? Failed firmware update? We have you covered! 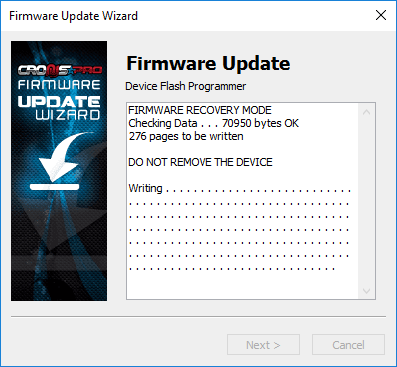 This repair guide will show you how to recover the CronusMAX's firmware which will allow you to get your CronusMAX back to it's factory default state. 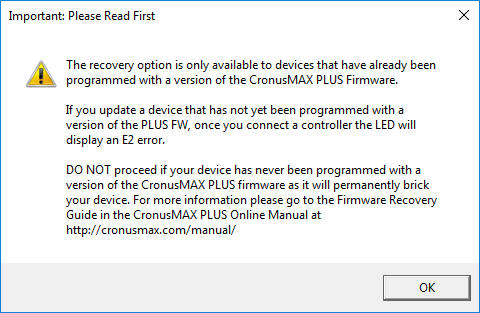 An internet connection is required to update the CronusMAX PLUS firmware. Follow the instructions here to correctly connect your CronusMAX PLUS to a PC. 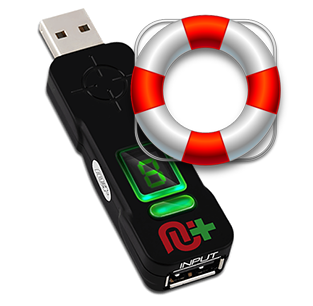 With the CronusMAX PLUS device connected to the computer via the PC PROG port with a mini-USB cable, open the Cronus PRO software. Give the reset button on the back of the device a few quick taps with a paperclip or other similar object until you get a P on the LED display. If there is no LED display even after hitting the reset button then unfortunately your CronusMAX is faulty and you should return it to the place of purchase and get it replaced under the terms of the warranty. 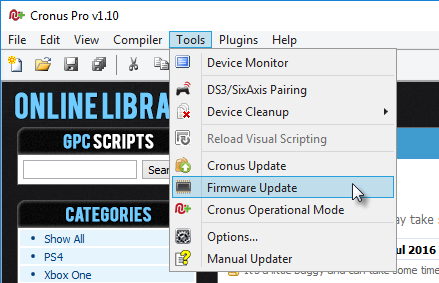 In Cronus PRO, go to the 'Tools' menu and click on 'Firmware Update'. You'll see the following popup message. Read it to make sure it doesn't apply to your situation. If you do have an older v1/v2 device and didn't take the opportunity to upgrade it with the CronusMAX PLUS Firmware during the 18 month upgrade window (January 2015 - July 2016), it is now unfortunately no longer supported. An easy way to know if your Cronus has had the PLUS firmware installed or not - the v1 and v2 does not unless you installed it yourself when the PLUS firmware upgrade was available, and the v3 does have it because it was pre-installed at the factory. You can find out which version device you have by checking out this page. 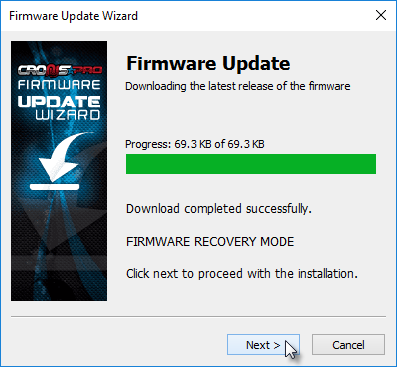 The Firmware Update Wizard will load, click next to continue. The Wizard will now download the latest Firmware from our servers. Click Next to continue. The Wizard will now program the Firmware to your CronusMAX PLUS. DO NOT disconnect or turn off your PC while the wizard is writing to your CronusMAX PLUS. The Wizard will automatically close when complete and your device will have the latest Firmware installed. You can verify this by looking in the status bar on Cronus PRO. If your CronusMAX PLUS is USB HUB Compatible - the USB Hub logo will be color. 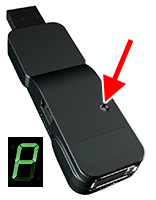 If your v1/v2 CronusMAX hardware is not USB HUB Compatible - the USB Hub logo will be gray. If you require USB Hub support (Full Time PS4 Crossover & PS4 Wheel Edition Mode) you will need to upgrade to a CronusMAX PLUS v3 model.